Background: Pseudomonas aeruginosa is one of the potent opportunistic pathogens associated with respiratory and urinary tract infection. The bacterium owes its pathogenicity due to the intrinsic resistance to antibiotics and disinfectants. 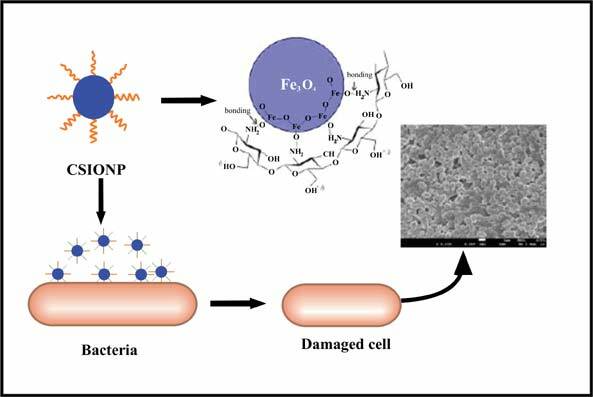 Objective: The present study is focused on the synthesis of antibacterial chitosan coated iron oxide nanoparticles for rapid inactivation of Pseudomonas aeruginosa. We have discussed the relevant patents on synthesis and antibacterial potential of metallic nanoparticles and chitosan. Method: Chitosan coated iron oxide nanoparticles were synthesized by coprecipitation method at room temperature using non-toxic chitosan and iron salts in alkali media. The particles were characterized and evaluated for antibacterial property against Pseudomonas aeruginosa. Results: The average size of the particles was measured as 52 nm. The surface area of the coated particles was as high as 90 ±5 m2/g. FTIR spectra confirmed the coating of chitosan on nanoparticles. The coated particles showed excellent antibacterial activity against the bacteria. The minimum inhibitory concentration of the coated particles was 105).g mol-1. The morphological alteration and cytoplasmic leakage of bacteria were confirmed by SEM image and release of intracellular constituents, respective- ly. Higher 260 nm absorbance value confirmed stronger antibacterial activity of the coated nanoparticles as compared to pure chitosan and bare iron oxide nanoparticles. Conclusion: The study indicated that chitosan coated iron oxide nanoparticles have superior antibacterial property as compared to pure chitosan and iron oxide nanoparticles. Chitosan, iron oxide nanoparticles, antibacterial activity, Pseudomonas aeruginosa, SEM image, chitosan-silver nano-composite. Department of Chemical Engineering, Indian Institute of Technology, Kharagpur, Kharagpur - 721302, India.